The Object interface, H5O, functions manipulate objects in an HDF5 file. This interface is designed to be used in conjunction with the Links interface (H5L). * These functions have been deprecated. The location will be specified by a location identifier, loc_id, and will be an HDF5 file or an object in a file, such as a group, dataset or named datatype. The name, name, will be a character string and will specify an object in an HDF5 file, such as a group, dataset or named datatype. name will specify that object by either an absolute path in the file specified by loc_id or by a relative path relative to loc_id. The loc_id and name combination, as used in these function calls, can interact in any of several ways. 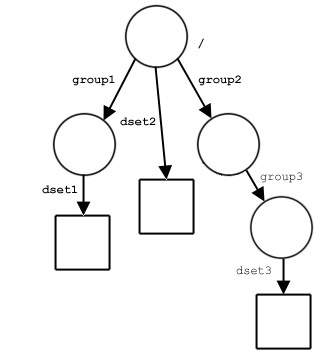 To illustrate, the following combinations all identify dset3 in the illustrated file structure. If loc_id is a file identifier, name must specify the object from the file’s root group, i.e., by an absolute path. If loc_id is a group identifier and the object of interest is a member of that group, name will simply be the name of the object. If loc_id is a group identifier but the object of interest is not a direct member of that group, name would generally specify the object by a relative pathe, relative to that group. For a related discussion of the structure of HDF5 files and HDF5 path names, see “The Structure of an HDF5 File” (particularly the subsection “HDF5 Path Names and Navigation”) in the “HDF5 Data Model and File Structure” chapter of the HDF5 User’s Guide . Closes an object in an HDF5 file. H5Oclose closes the group, dataset, or named datatype specified by object_id. This function is the companion to H5Oopen, and has the same effect as calling H5Gclose, H5Dclose, or H5Tclose. H5Oclose is not used to close a dataspace, attribute, property list, or file. Copies an object in an HDF5 file. source object to be copied. src_name   - Name of the source object to be copied. dst_loc_id - Location identifier specifying the destination. dst_name   - Name to be assigned to the new copy. hdferr     - Returns 0 if successful and -1 if fails. ocpypl_id  - Object copy property list. lcpl_id    - Link creation property list for the new hard link. Decrements an object reference count. H5Odecr_refcount decrements the hard link reference count for an object. It should be used any time a user-defined link that references an object by address is deleted. In general, H5Oincr_refcount will have been used previously, when the link was created. An object’s reference count is the number of hard links in the file that point to that object. See the “Programming Model” section of the “HDF5 Groups” chapter in the HDF5 User’s Guide for a more complete discussion of reference counts. If a user application needs to determine an object’s reference count, an H5Oget_info call is required; the reference count is returned in the rc field of the H5O_info_t struct. Determines whether a link resolves to an actual object. H5Oexists_by_name is used by an application to check that an existing link resolves to an object. Primarily, it is designed to check for dangling soft, external, or user-defined links. H5Oexists_by_name allows an application to determine whether the link name in the group or file specified with loc_id resolves to an HDF5 object to open or if the link dangles. The link may be of any type, but hard links will always resolve to objects and do not need to be verified. Note that H5Oexists_by_name verifies only that the target object exists. If name includes either a relative path or an absolute path to the target link, intermediate steps along the path must be verified before the existence of the target link can be safely checked. If the path is not verified and an intermediate element of the path does not exist, H5Oexists_by_name will fail. The example in the next paragraph illustrates one step-by-step method for verifying the existence of a link with a relative or absolute path. First use H5Lexists to verify that a link named group1 exists. If group1 exists, use H5Oexists_by_name to verify that the link group1 resolves to an object. If group1 exists, use H5Lexists again, this time with name set to group1/group2, to verify that the link group2 exists in group1. If the group2 link exists, use H5Oexists_by_name to verify that group1/group2 resolves to an object. If group2 exists, use H5Lexists again, this time with name set to group1/group2/softlink_to_group3, to verify that the link softlink_to_group3 exists in group2. If the softlink_to_group3 link exists, use H5Oexists_by_name to verify that group1/group2/softlink_to_group3 resolves to an object. And finally, if the link datasetD exists, use H5Oexists_by_name to verify that group1/group2/softlink_to_group3/datasetD resolves to an object. If the link specified by the loc_id and name does not exist, an error will be returned. If the link exists but does not resolve to an object for any reason, this routine will return FALSE, not FAIL. loc_id   - Identifier of the file or group to query. name     - The name of the link to check. link_exists - Existing link resolves to an object. hdferr      - Returns 0 if successful and -1 if fails. lapl_id  - Link access property list identifier. Retrieves comment for specified object. H5Oget_comment retrieves the comment for the specified object in the buffer comment. The size in bytes of the buffer comment, including the NULL terminator, is specified in bufsize. If bufsize is unknown, a preliminary H5Oget_comment call with the pointer comment set to NULL will return the size of the comment without the NULL terminator. hid_t object_id IN: Identifier for the target object. char *comment OUT: The comment. size_t bufsize IN: Anticipated required size of the comment buffer. obj_id - Identifier for the target object. hdferr  - Returns 0 if successful and -1 if fails. bufsize - Size of the comment buffer. H5Oget_comment_by_name retrieves the comment for an object in the buffer comment. The size in bytes of the comment, including the NULL terminator, is specified in bufsize. If bufsize is unknown, a preliminary H5Oget_comment_by_name call with the pointer comment set to NULL will return the size of the comment without the NULL terminator. hid_t loc_id IN: Identifier of a file, group, dataset, or named datatype. const char *name IN: Name of the object whose comment is to be retrieved, specified as a path relative to loc_id. name can be '.' (a dot) if loc_id fully specifies the object for which the associated comment is to be retrieved. loc_id   - Identifier of a file, group, dataset, or named datatype. specified as a path relative to loc_id. bufsize  - Size of the comment buffer. Retrieves the metadata for an object specified by an identifier. H5Oget_info specifies an object by its identifier, object_id, and retrieves the metadata describing that object in object_info, an H5O_info_t struct. Note that the information held by H5O_hdr_info_t might be useful only to developers with extensive HDF5 experience. object_id   - Identifier for target object. object_info - Buffer in which to return object information. Retrieves the metadata for an object, identifying the object by an index position. H5Oget_info_by_idx specifies a location, loc_id; a group name, group_name; an index by which obects in that group are tracked, index_field; the order by which the index is to be traversed, order; and an object’s position n within that index and retrieves the metadata describing that object in the struct object_info. object_info, in which the object information is returned, is a struct of type H5O_info_t. This struct type is described in the H5Oget_info function entry. in which object is located. group_name  - Name of group in which object is located. index_field - Index or field that determines the order. order       - Order within field or index. Retrieves the metadata for an object, identifying the object by location and relative name. H5Oget_info_by_name specifies an object’s location and name, loc_id and object_name, respectively, and retrieves the metadata describing that object in object_info, an H5O_info_t struct. The struct H5O_info_t is defined in H5Opublic.h and described in the H5Oget_info function entry. name        - Name of group, relative to loc_id. lapl_id     - Link access property list. Increments an object reference count. H5Oincr_refcount increments the hard link reference count for an object. It should be used any time a user-defined link that references an object by address is added. When the link is deleted, H5Odecr_refcount should be used. Creates a hard link to an object in an HDF5 file. H5Olink creates a new hard link to an object in an HDF5 file. To create the first hard link to an object that has just been created with H5Dcreate_anon, H5Gcreate_anon, or H5Tcommit_anon. hid_t object_id IN: Object to be linked. hid_t new_loc_id IN: File or group identifier specifying location at which object is to be linked. const char *new_link_name IN: Name of link to be created, relative to new_loc_id. Note that unless the object is intended to be temporary, the H5Olink call is mandatory if an object created with one of the H5*create_anon functions (or with H5Tcommit_anon) is to be retained in the file; without an H5Olink call, the object will not be linked into the HDF5 file structure and will be deleted when the file is closed. object_id     - Object to be linked. which object is to be linked. new_link_name - Name of link to be created, relative to new_loc_id. hdferr        - Returns 0 if successful and -1 if fails. lcpl_id       - Link creation property list identifier. lapl_id       - Link access property list identifier. Opens an object in an HDF5 file by location identifier and path name. H5Oopen opens a group, dataset, or committed (named) datatype specified by a location, loc_id, and a path name, name, in an HDF5 file. This function opens the object in the same manner as H5Gopen, H5Topen, and H5Dopen. However, H5Oopen does not require the type of object to be known beforehand. This can be useful with user-defined links, for instance, when only a path may be known. H5Oopen cannot be used to open a dataspace, attribute, property list, or file. Once an object of unknown type has been opened with H5Oopen, the type of that object can be determined by means of an H5Iget_type call. loc_id can be either a file or group identifier. name must be the path to that object relative to loc_id. lapl_id is the link access property list associated with the link pointing to the object. If default link access properties are appropriate, this can be passed in as H5P_DEFAULT. When it is no longer needed, the opened object should be closed with H5Oclose, H5Gclose, H5Tclose, or H5Dclose. const char *name IN: Path to the object, relative to loc_id. loc_id  - File or group identifier. name    - Path to the object, relative to loc_id. obj_id  - Object identifier for the opened object. link pointing to the object. Opens an object using its address within an HDF5 file. H5Oopen_by_addr opens a group, dataset, or committed (named) datatype using its address within an HDF5 file, addr. The resulting opened object is identical to an object opened with H5Oopen and should be closed with H5Oclose or an object-type-specific closing function (such as H5Gclose) when no longer needed. loc_id can be either the file identifier or a group identifier in the file. In either case, the HDF5 Library uses the identifier only to identify the file. The object’s address within the file, addr, is the byte offset of the first byte of the object header from the beginning of the HDF5 file space, i.e., from the beginning of the super block (see the “HDF5 Storage Model” section of the “The HDF5 Data Model and File Structure” chapter of the HDF5 User’ Guide ). addr can be obtained via either of two function calls. H5Gget_objinfo returns the object’s address in the objno field of the H5G_stat_t struct; H5Lget_info returns the address in the address field of the H5L_linkinfo_t struct. This function is dangerous if called on an invalid address. The risk can be safely overcome by retrieving the object address with H5Gget_objinfo or H5Lget_linkinfo immediately before calling H5Oopen_by_addr. The immediacy of the operation can be important; if time has elapsed and the object has been deleted from the file, the address will be invalid and file corruption can result. The address of the HDF5 file on a physical device has no effect on H5Oopen_by_addr, nor does the use of any file driver. As stated above, the object address is its offset within the HDF5 file; HDF5’s file drivers will transparently map this to an address on a storage device. loc_id - File or group identifier. addr   - Object's address in the file. obj_id - Object identifier for the opened object. Open the nth object in a group. H5Oopen_by_idx opens the nth object in the group specified by loc_id and group_name. loc_id specifies a file or group. group_name specifies the group relative to loc_id in which the object can be found. If loc_id fully specifies the group in which the object resides, group_name can be a dot (.). An object opened with this function should be closed when it is no longer needed so that resource leaks will not develop. H5Oclose can be used to close groups, datasets, or committed datatypes. loc_id      - A file or group identifier. group_name  - Name of group, relative to loc_id, in which object is located. index_type  - Type of index by which objects are ordered. order       - Order of iteration within index, NOTE: zero-based. n           - Object to open. obj_id      - An object identifier for the opened object. H5Oset_comment sets the comment for the specified object to the contents of comment. Any previously existing comment is overwritten. obj_id    - Identifier of the target object. comment   - The new comment. H5Oset_comment_by_name sets the comment for the specified object to the contents of comment. Any previously existing comment is overwritten. const char *name IN: Name of the object whose comment is to be set or reset, specified as a path relative to loc_id. comment  - The new comment. H5Ovisit is a recursive iteration function to visit the object object_id and, if object_id is a group, all objects in and below it in an HDF5 file, thus providing a mechanism for an application to perform a common set of operations across all of those objects or a dynamically selected subset. For non-recursive iteration across the members of a group, see H5Literate. The H5O_info_t struct is defined in H5Opublic.h and described in the H5Oget_info function entry. The H5Ovisit op_data parameter is a user-defined pointer to the data required to process objects in the course of the iteration. This pointer is passed back to each step of the iteration in the callback function’s op_data parameter. H5Lvisit and H5Ovisit are companion functions: one for examining and operating on links; the other for examining and operating on the objects that those links point to. Both functions ensure that by the time the function completes successfully, every link or object below the specified point in the file has been presented to the application for whatever processing the application requires. These functions assume that the membership of the group being iterated over remains unchanged through the iteration; if any of the links in the group change during the iteration, the resulting behavior is undefined. hid_t object_id IN: Identifier of the object at which the recursive iteration begins. hdferr       - Returns 0 if successful and -1 if fails. Recursively visits all objects starting from a specified object. H5Ovisit_by_name is a recursive iteration function to visit the object specified by the loc_id / object_name parameter pair and, if that object is a group, all objects in and below it in an HDF5 file, thus providing a mechanism for an application to perform a common set of operations across all of those objects or a dynamically selected subset. For non-recursive iteration across the members of a group, see H5Literate. The op callback funtion and the effect of the callback function’s return value on the application are described in H5Ovisit. The H5Ovisit_by_name op_data parameter is a user-defined pointer to the data required to process objects in the course of the iteration. This pointer is passed back to each step of the iteration in the callback function’s op_data parameter. loc_id      - Identifier of a file or group. lapl_id      - Link access property list identifier. Provides the mechanism by which a user application may set an action for H5Ocopy to take after checking all suggested paths for a matching committed datatype but before starting the global search of the destination file. H5O_mcdt_search_cb_t is the callback function that H5Ocopy will invoke if the callback is set and when the merge committed datatype feature is enabled in the object copy property list (see H5Pset_copy_object). After searching the list of suggested committed datatype paths, H5Ocopy will invoke this callback before searching all committed datatypes in the destination file. This allows a user application to add a customized step to the search process. The callback function is set with H5Pset_mcdt_search_cb and the search process is described in H5Padd_merge_committed_dtype_path. H5O_MCDT_SEARCH_CONT Continues the global search of all committed datatypes in the destination file. H5O_MCDT_SEARCH_STOP Stops the search, but continues copying. If the callback’s return value is H5O_MCDT_SEARCH_ERROR, H5Ocopy will abort and the destination file may be left in an inconsistent or corrupted state. void *op_data IN/OUT: Pointer to user-defined input data. This is a pass-through of the data that was passed to H5Pset_mcdt_search_cb.